According to the Sales Records act, the seller is obliged to issue a bill to the buyer. Simultaneously, seller is obliged to register the received revenue to tax administrator online; in case of malfunction, no longer than 48 hours after purchase. Are you interested in working in young and progressive collective? We are looking for a chef for a long term cooperation. Experience with preparation of raw food is welcomed, but not necessary. You can send your CV and cover letter to myraw@myraw.cz. 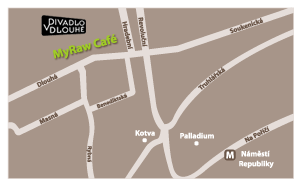 We offer cooperation in form of franchising for those, who would like to open MyRaw Café in their own town in Czech rep. or abroad. We will happily discuss the conditions personally or via Skype.